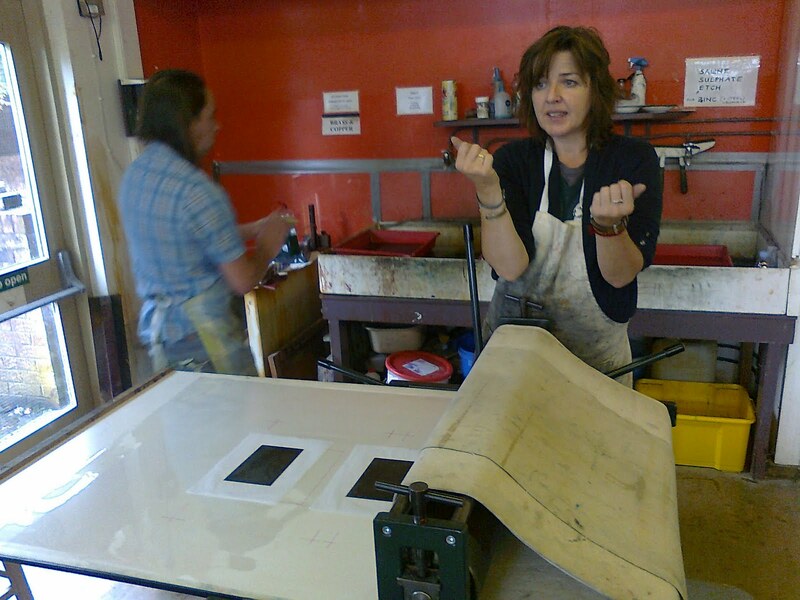 I had a lucky day last week when I was able to spend the day in the print room at Gracefield learning new stuff. I do enjoy learning new stuff but I am prone to getting a little waylaid by these things and maybe losing track of where I should be. Printing, I did some of on my foundation at uni and then didn’t do any more until I spent that day with Lisa Hooper last year. I do have a certain something that draws me to prints whenever I am in galleries, there’s something about it that strongly appeals to me. I got the chance to do some non toxic etching. I’ve only ever done it with acid baths and copper plate before but this is on zinc plate, the ground is made with acrylic floor polish and black ink and the solution to etch in is copper sulphate which apparently doesn’t give off the nasty fumes that the traditional methods do. This is Tina who was teaching the processes. 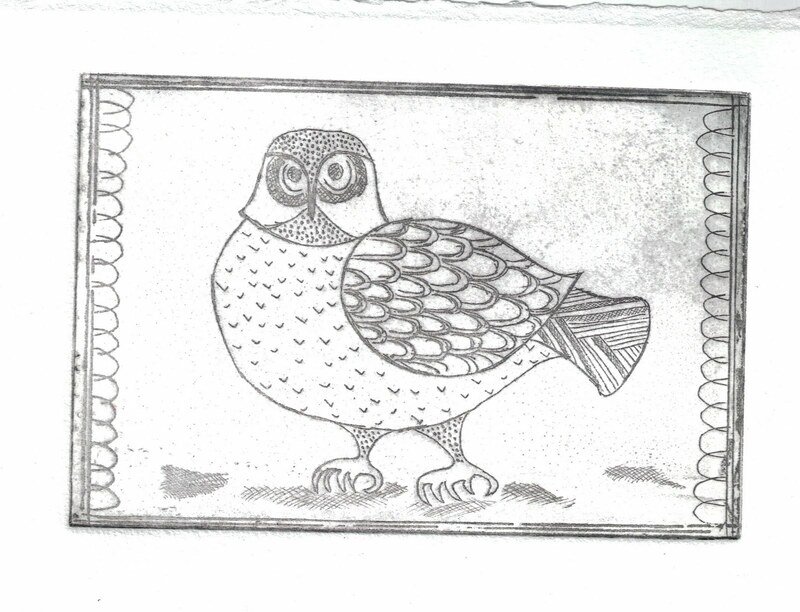 The print of the owl at the top of the page is done in dry point, I’ve never done that before at all. Again traditionally it is done on metal plate. This though was done into acetate though with a sharp pin. Of course the ‘plate’ won’t last anywhere near as long as a metal plate would but I likes the result, and it’s surprising that it would work at all really. This fat boy was the etched plate. He’s a bit bog eyed isn’t he. Shame. So that was my exciting day last week. I think the printing techniques do have a link with the sgraffito and trailing that I do everyday. It was interesting seeing the pieces made by the others with me who are all artists by which I mean they do paintings and drawings and not pots. Their style of drawing is so very different from mine. They draw as I feel that ‘proper’ drawings should be done. 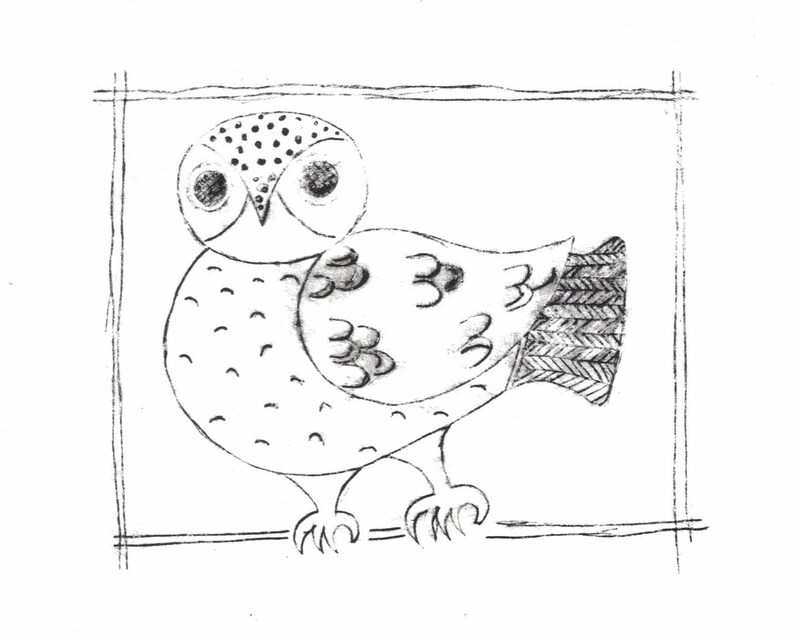 My drawings, to me, tend to feel very childish. I always worry about my drawing skills or lack there of. Most of the time they do what I want them to do even if I don’t ever feel they are something to show off and of course trailing slip demands a particular way of working anyway which seems to work for me. Anyway maybe when I have some of that illustrious ‘free time’ I should go and spend a bit of time in the print room again, it’s pretty well equipped and it’s not really that far away. In the mean time I am making pots for an exhibition in Carlisle and one in Penrith and some Christmas stock too. Today has been good, I got a whole list of orders thrown and a decent dent made in the first exhibition list. Feels good. On a Biscuit update in case you were wondering, she has turned into a right wee monkey, not literally you understand. One night a week or so ago I woke up not understanding what was going on and why I was being jabbed in the hip from underneath the bed. I discovered the cat sitting under the bed amusing herself by prodding the mattress between the wooden slats. Now she has mastered the art of the cat flap. I have spent the last two weeks trying to give a cat flap usage lesson each morning, you can imagine, me kneeling on the floor head butting the cat flap and the cat sitting next to me with a very puzzled and slightly amused look on her face before about turning and heading to sit in the window sill. She got the out bit fairly easily but the in bit took a lot longer. Last week she brought us her first offerings of a tiny pair of kidneys. Yum, we had them on pizza. She now spends most of the night out gallivanting and fraternizing with cows and pheasants and owls and heaven knows what else and then comes in with muddy feet and wanders about all over the house, yes we can tell exactly where she’s been, seems there was a party in the bath room last night! Hope she doesn’t start trying to bring her new friends in for late night raves. 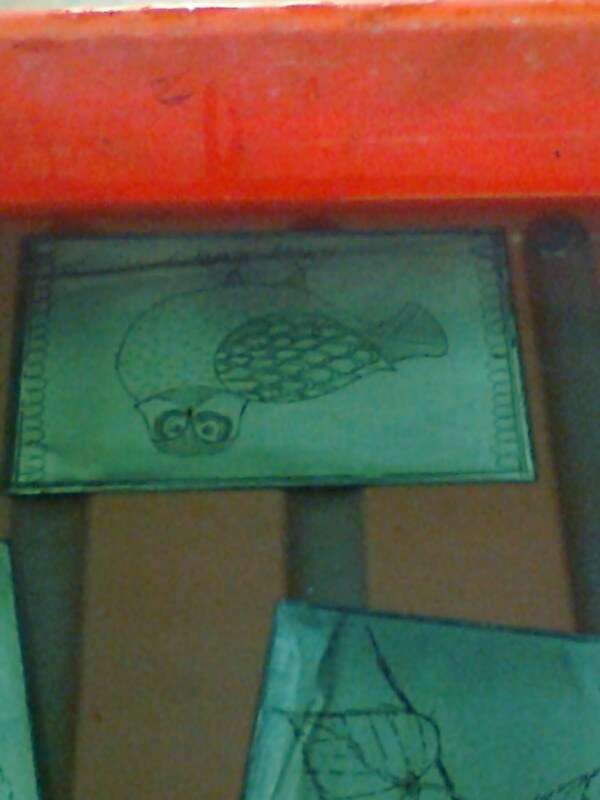 This entry was posted in biscuit, etching, print making. Bookmark the permalink. One of ours has taken to bringing us mice in every night – some are still alive, he's a little monkey too. And he does not wipe his feet! Cool printing. I'd like to have a go at that sometime. We really need a cat/dog flap! !